For some reason, I have been craving a taste of home lately. I tried my best with my version of comfort food: century egg porridge. But I wanted something sweet. I wanted something that tastes like home but with my own unique twist. 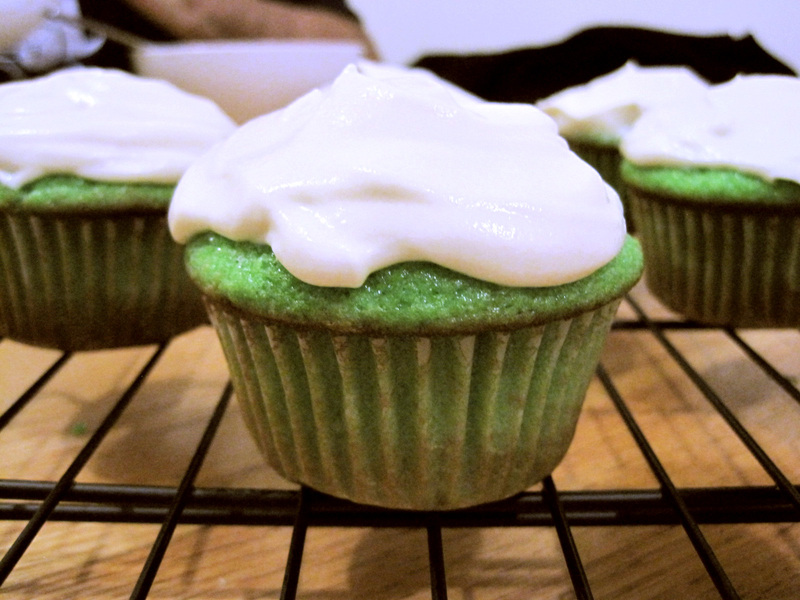 And thus I present, a fusion of East meets West: pandan cupcakes with kaya whipped cream frosting. The English word for pandan is screwpine. I only found out about that recently, actually. Kaya is a coconut and egg jam that is typically flavored with either pandan or gula melaka, i.e. palm sugar. 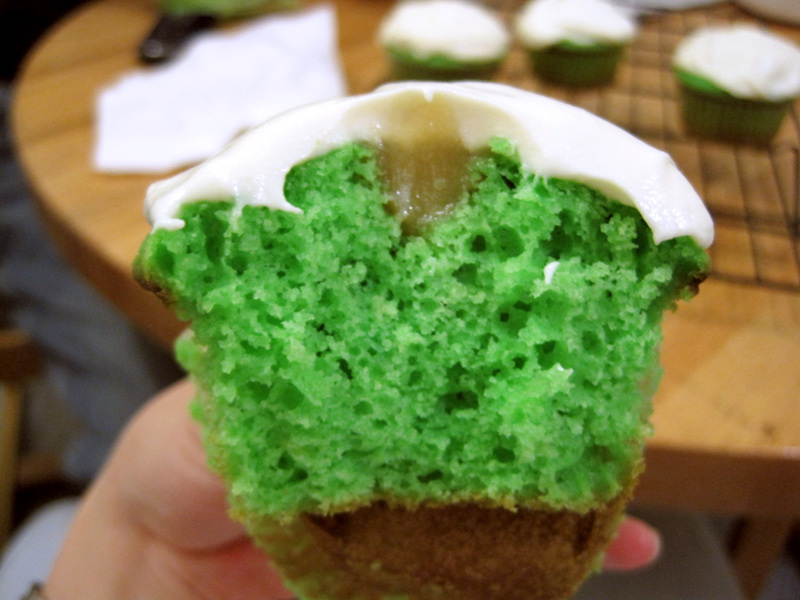 I googled “pandan cupcakes”, and found a recipe that included yogurt. I had a bucket of it sitting in my fridge, which I thought would substitute for chocolate pudding if I added cocoa powder and sweetener in it, but that didn’t work out quite so well. I don’t really like yogurt by itself – it’s usually too sweet, or too sour – and it just feels very gloopy in the mouth. I won’t say no to froyo, though. The cupcakes had a nice brown rim on the edge of the cupcake, and it really provided a nice textural contrast to the cupcake. I’m not extremely fond of the texture itself. The recipe called for cake flour, but I only had all-purpose flour so I used that instead. Perhaps that created a less tender crumb. The cupcake had a texture not unlike like fa gao. It was slightly rubbery, I thought. That’s not a good thing though. 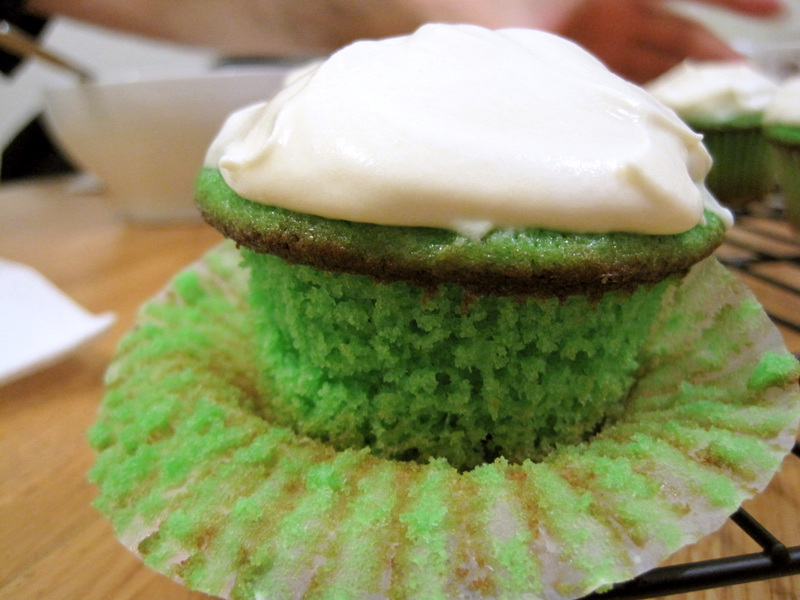 I cored the cupcakes and added a small amount of kaya in it, just for a nice little hit of kaya, but the kaya I got was very mediocre. I wouldn’t want anymore in my cupcake. The brand of the kaya is Yeo’s. It was the only brand available – I didn’t have a choice! Maybe I could try my hand at homemade kaya some day… some day. Line 7 cupcake tins; and preheat oven to 350F. Mix flour, baking powder, baking soda, and salt in a small bowl. Set aside. 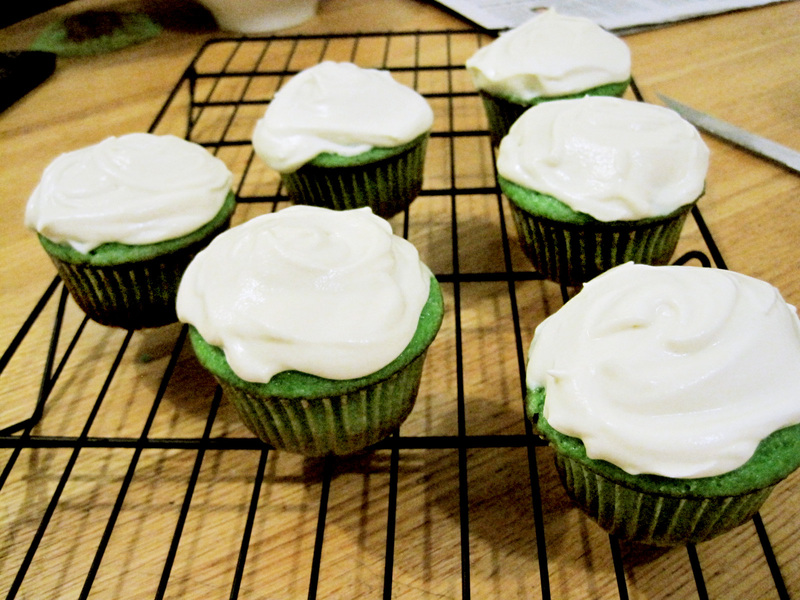 Mix yogurt and pandan paste; set aside. Cream butter and sugar in a medium bowl till light and fluffy. Add egg and mix till incorporated. Add 1/3 portion of flour mixture to butter mixture. Add 1/2 of yogurt mixture to butter mixture. Add another 1/3 of flour to butter mixture. Add remaining yogurt mixture to butter mixture. Add remaining flour to butter mixture. Divide into 7 cupcake liners and bake for 18 minutes, turning from front to back midway. Cool in pan for 7 minutes. Remove and cool on rack. When completely cool, core cupcakes. I used a narrow knife and cut a pyramid-shaped piece out in the middle. Fill holes with kaya. Do not overfill. Add sugar to heavy cream. Beat till soft peaks form. Fold in kaya. 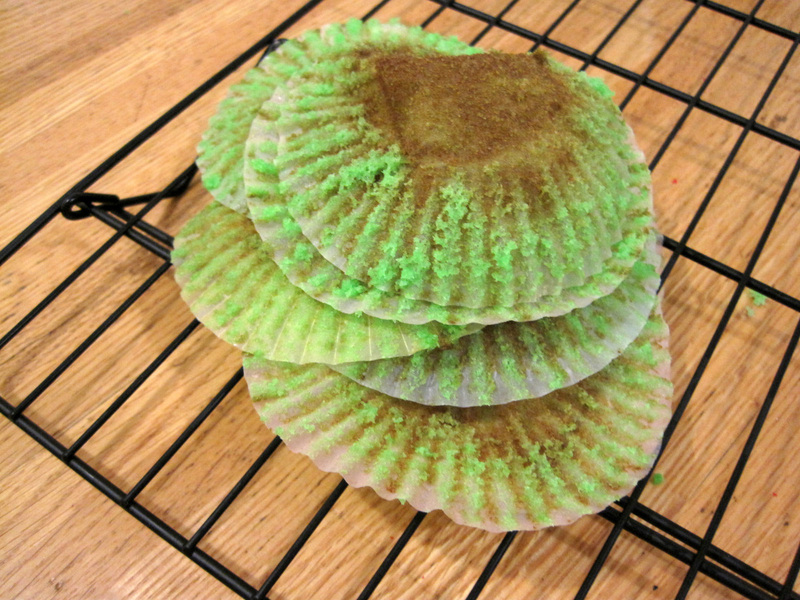 Frost on completely cool cupcakes.